The Biston Wheelchair bag has been designed by chartered physiotherapists to reduce the risk of injury while maneuvering wheelchairs. The bag features strategically placed handles which increase stability when lifting and improve grip. 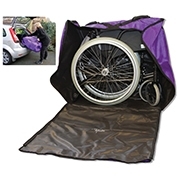 This design helps loading or unloading a folded wheelchair into a car boot feel lighter. Maneuvering a wheelchair using the Biston Bag enables the user to maintain good body posture by preventing over reaching. It also helps eliminating twisting therefore reducing the risk of injury. Manufactured in the UK by Sutherland Health Group Plc the Biston Wheelchair Bag is made from durable fabric with superior stitching, zips and fastenings.